Washington, D.C. – The long-awaited Harvey Milk commemorative postage stamp is now a reality, according to Linn’s Stamp News. 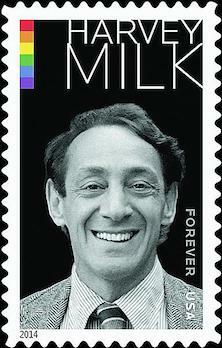 A black-and-white photo image of Harvey Milk will be the central feature of this non-denominated U.S. Postage “Forever” Stamp. The stamp design includes the colors of the Rainbow Flag in six differently colored squares stacked vertically in the upper left corner. First day of issue is planned to be May 22, 2014, Harvey Milk Day, to celebrate the San Francisco gay politician, activist, and city supervisor. Cities likely to be chosen as first issue sites are Washington, D.C. and San Francisco, California. Milk, who is recognized throughout the world as a hero and martyr of the LGBTQ and human rights struggle, was a U.S. Navy veteran, and one of the earliest openly gay elected officials in the United States, winning a seat on the San Francisco Board of City Supervisors in 1977. 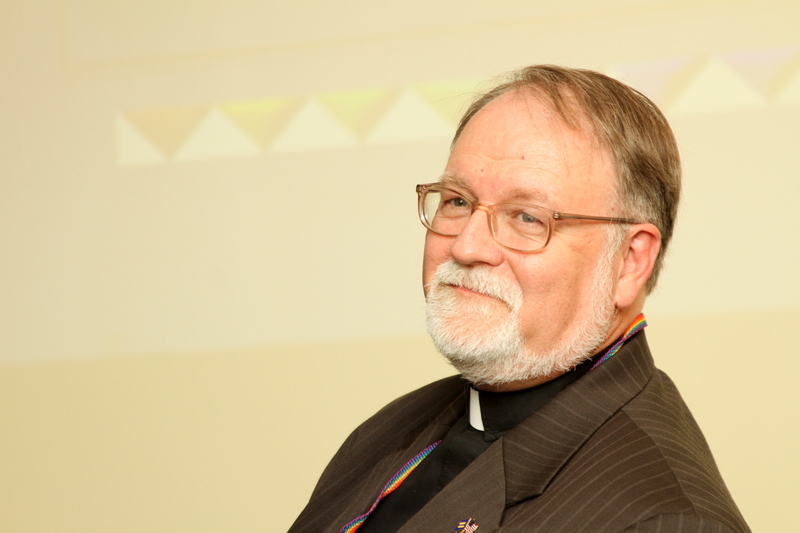 Though gay rights was a major emphasis of his political career, Milk also championed affordable housing, city sanitation, expanded child care, and public transportation. He was shot to death in his City Hall office on November 27, 1978 by Dan White, his one-time colleague who blamed his actions on momentary insanity and disorientation from eating too many sugary desserts. White also shot and killed San Francisco Mayor George Moscone the same day. The appearance of this commemorative stamp marks the first time a gay hate crimes murder victim has been publicly honored in this way. EDGE on the Net reports that The stamp, likely to be issued in a pane of 20, will be used to mail a one-ounce letter regardless of when the stamp is purchased or used and no matter how future prices fluctuate. The current value of the stamp is 49 cents. April 2, 2014 - Posted by	unfinishedlives | anti-LGBT hate crime murder, California, gay men, GLBTQ, Harvey Milk, Harvey Milk Commemorative Postage Stamp, Harvey Milk Day, Harvey Milk Foundation, Hate Crimes, Heterosexism and homophobia, LGBTQ, San Francisco, U.S. Postal Service (USPS), Washington, D.C.	| anti-LGBT hate crime murder, California, gay men, GLBTQ, Harvey Milk, Harvey Milk Commemorative Postage Stamp, Harvey Milk Day, Harvey Milk Foundation, Hate Crimes, Heterosexism and homophobia, LGBTQ, San Francisco, Stuart Milk, U.S. Postal Service (USPS), Washington D.C.